Is this the flexible, low-cost hybrid we've been waiting for? This is an attractively priced and usable hybrid, but it's underpowered compared to rivals. Hybrids. Windows tablets. 2-in-1 laptops. There was a wave of these types of machines when Windows 8 appeared and touted a very touch-centric interface, and it’s going strong. We’ve seen a ton of twisty laptops from the likes of the Acer Aspire Switch 10, Lenovo’s IdeaPad Yoga 2 11 and the Dell XPS 11. And, now we get to take a look at HP’s Pavilion x360. Though x360 sounds more like a gaming moniker than a cute little portable home machine, you're looking at a very lightweight laptop in terms of specs here. Powered by a low-energy Intel Celeron CPU, usability and value are the orders of the day – this 11.6-inch machine comes in at just £350 (around US$565, AU$645), but we suspect some Black Friday and Cyber Monday deals will knock the price down. It comes in silver or the utterly adorable red colour of our review unit, with the entire outside clad in a kind of candy apple red matt plastic, with silver around the keyboard and a black display bezel. And yes, that display folds from closed like a normal laptop all the way around so that it's open flat against the back of the machine – just about 360 degrees, hence the name. The HP Pavilion x360 is pretty small, though far from the smallest device you’ll find among the Black Friday laptop deals. There’s a lot of unused space around the 11.6-inch, 1,366 x 768 display, but at least the keyboard has some space. It’s practically a full-sized keyboard. The 22mm thickness again isn't bad, but is far from the thinnest, and at a weight of 1.4kg, it's roughly 40% heavier than the 11-inch MacBook Air. Still, it feels churlish to complain about these things too much – it's still fairly light, quite compact and is built very nicely indeed, with the whole thing feeling rock solid, save for a little bit of flex in the lid. There's even a decent selection of ports, with one USB 3.0 connection, two USB 2.0 ports, HDMI out, Ethernet, an SD card slot, and a joint mic/headphone 3.5mm jack. Also on the edge is a volume rocker, for use in tablet mode. The HP Pavilion x360 is rather light when it comes to specifications, which is perhaps no surprise given its size and cost. At the heart of this machine is an Intel Celeron N2820 processor, which is dual-core and runs at 2.13GHz (it's capable of increasing to 2.39GHz for some intensive applications, but we wouldn't expect much of a performance increase from that boost). Despite being dual-core and having what seems to be a decent clock speed, though, don't expect much performance out of this chip. 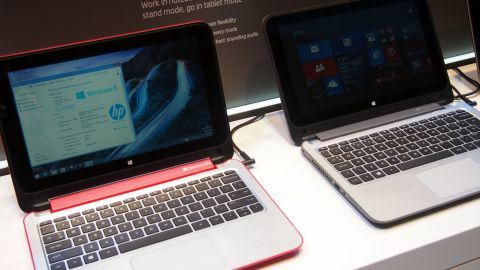 It's based on Intel's Silvermont architecture, used in the company's Atom processors – more like what you see in tablets such as the iPad Air or Samsung Galaxy Tab Pro 10.1 than even the budget-priced HP Pavilion TouchSmart 15-n070sa. However, the potential advantage of using this chip (other than keeping costs down) is that it's very, very low power, so it could lead to great battery life. The graphics are handled by Intel too, with integrated HD graphics – but again, that's nowhere near the power of the Iris graphics in the 13-inch Retina MacBook Pro, for example. It does support DirectX 11, but once again, we're talking more tablet power than even a mild gaming laptop. The 4GB of RAM available is, well, the minimum expected these days, but it should be perfectly serviceable for most users, given that you're unlikely to really be able to do anything intensive on the Pavilion x360's processor anyway. The 500GB hard drive spins at 5400rpm, meaning it's likely to be a bit of a performance bottleneck as far as the general speed of the machine goes. However, for the £350 price, it's a decent size, and we wouldn't really expect anything faster. The 11.6-inch display is multi-touch capable for both using the x360 in tablet mode generally, as well as playing some touch-based games. The resolution of 1366 x 768 is perfectly good for its size (it's the same as the much more expensive 11-inch MacBook Air), and in fact many budget or mid-range 15-inch laptops, including the notably more expensive Toshiba Satellite M50. You've got Beats Audio speakers to help boost its credentials as a media machine slightly, though you rarely see an HP laptop without them these days. When it comes to getting online, you've got an Ethernet port (though it's only 10/100 – not Gigabit) and Wi-Fi b/g/n. Bluetooth 4 is supported, usefully, so it could work with the new wave of wearable devices that are emerging. And as we mentioned, you've got one USB 3.0 port for fast external file access, as well as two USB 2.0 ports. An HDMI port gives you video output, an SD card reader lets you import photos and a 3.5mm jack is present to plug in your headphones.